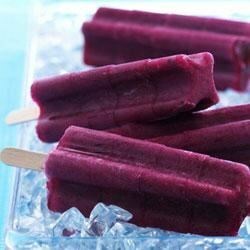 Try refreshing Frozen Blueberry Yogurt Pops from Ocean Spray for a treat the whole family can enjoy all summer long. Combine all ingredients in blender. Cover; blend on high speed 15 to 20 seconds or until smooth. Pour into 8 frozen pop molds (2.5 ounces to 3 ounces each). Cover, insert craft sticks, and freeze for 2 hours or until completely firm.